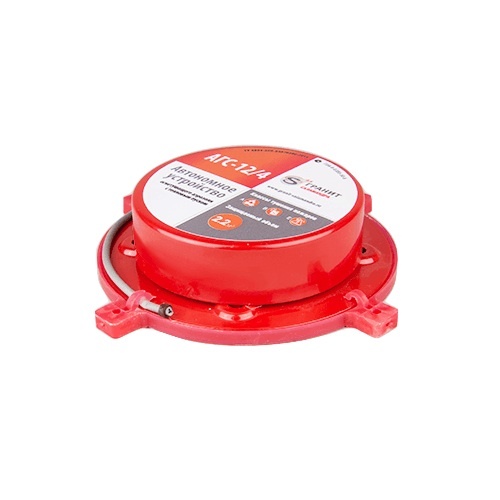 DESIGN: AGS-12 series aerosol fire extinguishers are newly developed units which provide standalone operation where there is no possibility or necessity to supply electric power and/or automatic control. AGS-12/4 provide protected capacity of 2.2 m3. It consists of the steel housing, which houses the aerosol-forming cartridge, and the thermo-chemical starter activated by thermo cord wrapped around the housing. The aerosol-forming cartridge is separated from the top and the bottom of the housing by heat shield material. On the side surface all around the housing there is a gap nozzle which provide the aerosol outflow. OPERATION: AGS-12 series aerosol fire extinguishers using thermo cord acting as a heat detector and heat transfer to self-activating thermochemical starter triggered when the temperature rises above 180°С. Aerosol cartridge produce large volume of fire extinguishing aerosol streaming through the cooling layer and coming out of fire extinguisher through the nozzle. Thanks to its unique properties aerosol stops the fire and prevents following reignition. APPLICATION: AGS-12 series standalone aerosol fire extinguishers are used for fire protection of small volumes (electric cabinets, diesel generators, engine compartments, etc. ), including those installed on various types of vehicles. WARRANTY: Manufacturer guarantees that fire extinguisher conforms to declared technical specs and standards if the consumer strictly follows the Instruction Manual. Certificates available on request. Please complete the form below. Manual is available on request. Please complete the form below. Copyright © 2015 Salamandra Safety Inc.